About David Ward (Author) : I am a Canadian children's author. I also teach and research in children's literacy in Oregon. 5stars Yeats Trafford, age 12, visits his grandmother, who lives in a creepy house which has more than the usual creeks and moans. The garden seems able to sense Yeats presence, especially near the old wishing well. From that weird experience, Yeats uncovers an old pirate bookend that was “kicked out” of the library 20 years earlier. Yeats cleans the old guy and takes him to gran’s library, reuniting him with his matching bookend. From there, a strange yet believable world opens up to Yeats. He has heard the story of his father’s own journey with the pirate bookends and is determined to make the same trip. Yeat’s wants to finish his father’s journey hoping it will keep his parents together. Yeats must bring home the girl left behind 20 years ago when she and Yeat’s father went on their own journey. Where does Yeats and the pirate bookends (named Skin and Bones), journey? Into the pages of The Arabian Nights. Yeats must find a way to bring Shari, Shaharazad in the story, home without actually rescuing her. Shari/Shaharazad must want to return on her own before the spell she is under will break – a spell only Shaharazad remembering another reality can break. Yeats cannot force her to return. Yeat’s father could not get Shari, now living as Shaharazad, to return. She has been inside the story for 20 years. Yeats has an impossible task before him. Funny guys Skin and Bones refuse to help. Maybe it’s of a pirate’s code (of dishonor)? Skin and Bones transport Yeats, leaving him on his own, inside the shore of The Arabian Nights I really liked this story. It was difficult to put the book down. There is adventure, romance, harrowing action and lots of humor, especially from Skin and Bones. Shari has been in the story as Shaharazad, the king’s storyteller and the one person who can get the king to sleep. Shaharazad might be telling the king boring stories, but in Between Two Ends, not one boring word can be found. 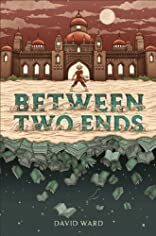 The author, David Ward, does a masterful job creating the world of The Arabian Nights, capturing the lost souls, the resident’s desperation, and the danger Yeats encounters, brilliantly. The “original” Arabian Nights, known in the US as A Thousand-and- One Arabian Nights, has more than 1000 pages in some older versions. A currently available version has 912 pages. 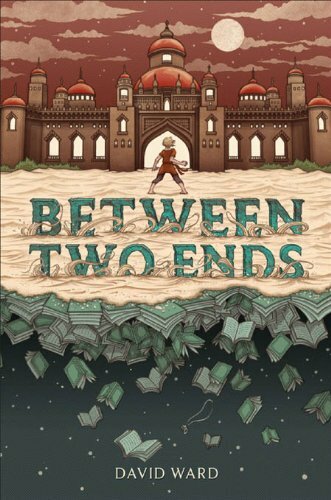 David Ward’s Between Two Ends could easily be part of an Arabian Nights tale for the twenty-first century. Plus, with less than 300 pages, it is a faster read. Note: received from netgalley, courtesy of the publisher.